Fort Wayne, Indiana is known by many as “The City of Churches.” It is home to many places of worship, large and small, of various denominations. 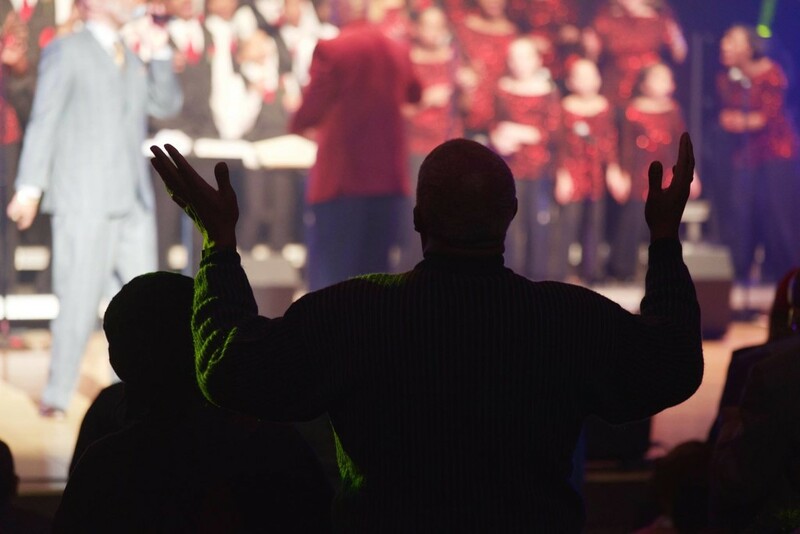 While there are many churches within our community, the opportunities for all the congregations to come together, to enjoy a common, unifying experience of praise and worship, are rare. 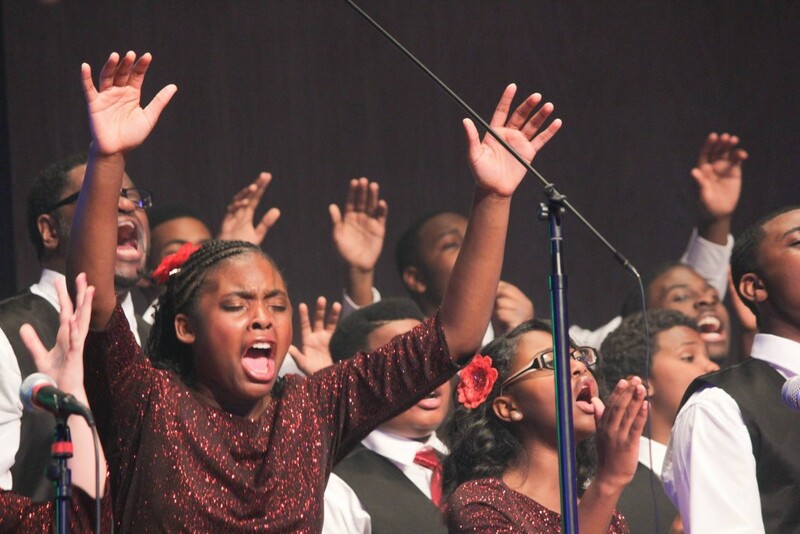 Although Unity Performing Arts Foundation (UNITY) is not considered a faith-based organization, each year, its premiere youth choral program, The World Champion Voices of Unity Youth Choir (VOUYC), hosts Praise Celebration, which unifies the local arts community, and members of the local religious community. Talented local and regional worship leaders, community members, and even national recording artists and musicians, gather in our city to participate in this annual event. This year’s Praise Celebration, entitled “Hosanna,” took place on Sunday, January 10, 2016 at the Rhinehart Music Center’s Auer Auditorium, located on the campus of Indiana University-Purdue University. Many people use the beginning of the year as a time to reflect, refresh and renew in various areas of their lives. Praise Celebration has become an ideal platform to engage in such reflection and forward vision for the entire community. UNITY has many great accomplishments to reflect upon, and so much to look forward to this year. The organization continues to build interest and enthusiasm surrounding its upcoming summer European tour. 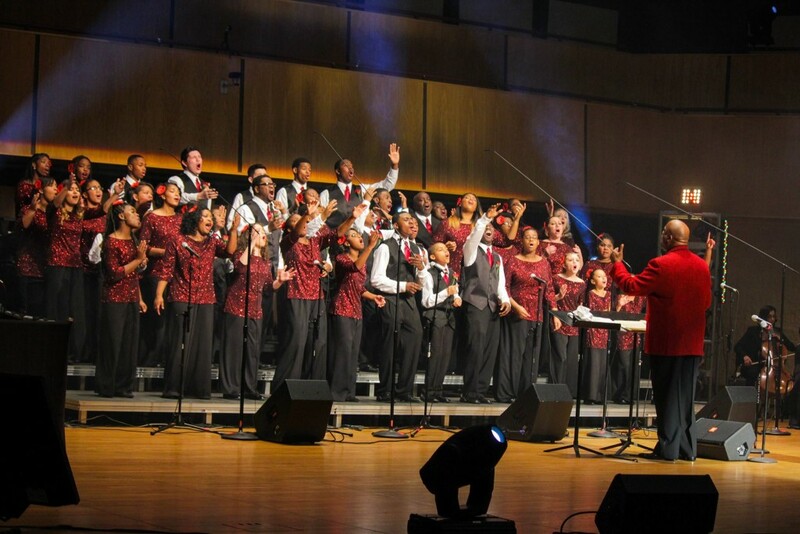 UNITY’s Founder and CEO, Mr. Marshall White announced the choir would be making yet another significant international trip to Rome and Venice, Italy, including a special performance at the Vatican, Graz, Austria and Budapest, Hungary to participate in a series of concerts and competitions. This tour, and UNITY’s many previous accomplishments gives them, and the Fort Wayne community much to be thankful and give praise for. When attending a VOUYC production, one can be sure to expect the highest level of excellence in every single aspect, from the musical and oratorical presentations, multimedia, staging, choreography and uniforms. In addition to unifying the various congregations and the arts community, another outstanding component of UNITY is its ability to combine the soulful sounds of its band, led by Grammy Award-winning Fort Wayne native, Lance Tolbert, and the classical sounds of its orchestra, led by Fort Wayne Philharmonic principal violist, Derek Reeves. The energy in the auditorium, during this uplifting concert, mirrored that of a sacred place of worship. People extended their hands to God, clapped their hands, shouted with triumphant voices, cried cleansing tears of joy and release, danced and sang along to the music. The celebration featured music by various notable mainstream, inspirational and gospel/Christian music artists, including Norman Hutchins, John Legend, Common, Chris Byrd, Tasha Cobb, Passion/Trey McLaughlin, Kirk Franklin, Heartland Worship Team, Frontline Worship, Vashawn Mitchell, Michael Smith, and Fort Wayne native, Marcellus Barnes. The evening began with greetings from the emcee, Melissa Montana, radio host of the local STAR 88.3. Following her greetings came additional greetings from other community dignitaries, including Dr. Gregory Jones of the IPFW Music Department, Eric Doden, CEO of Greater Fort Wayne, Inc. and a beautiful invocation by Pastor Anthony Payton of Greater Come as You Are Community Church. VOUYC student, Lauryn Jones, presented an opening monologue, written by Mr. Chad Edmonds, our Expression Creative Writing Artistic Director, encouraging onlookers to look within, to find the answers to the many problems we face, individually, and collectively. She also admonished the audience to give thanks and praise to God for sustaining us all, through another year. Lauryn’s monologue was a perfect segue to the opening, title song, “Hosanna,” led by Ron Bishop, of South Bend, IN. The song featured the UNITY dancers, choreographed by UNITY alumnus, Dominique Evans. Standout moments during this Praise Celebration include the powerful song, “Glory,” from the motion picture soundtrack “Selma.” The song was led by local celebrity, Cameron “Cam B” Brooks. UNITY student Ja’Shawn Turner-Parks made his stage debut by rapping the lyrics made famous by rapper, Common. Renowned producer and songwriter, Chris Byrd, joined the choir in singing his reggae-style, original song, “I Am Rich with God’s Blessings.” Mr. Byrd has worked with several gospel recording artists, including Rance Allen. His brother, Dennis Byrd (also present for the concert) is the composer of “Genesis,” a popular song in the gospel/choral music sector, and in the VOUYC repertoire. UNITY alumnus, Deven Bridges, took to the stage to end the first half of the concert with an energetic presentation of “A God Like You,” by Kirk Franklin. 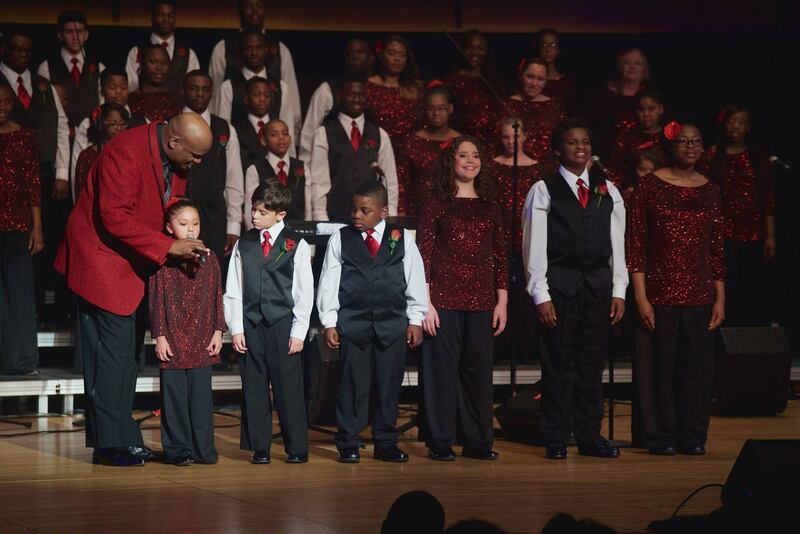 He returned to the stage to join the choir in beginning the second half of the concert, with an equally energetic performance of the classic hip-hop style gospel song, “Stomp,” by Kirk Franklin and God’s Property. VOU alumni Jordan Applegate and Jocelyn Redmond led the choir in singing a beautiful worship song entitled “God of Peace,” recorded by Heartland Worship Team of Indianapolis, IN. Jordan Applegate is a member of Heartland Worship Team and was part of the original recording of the song, which made the top selling contemporary Christian list on iTunes. 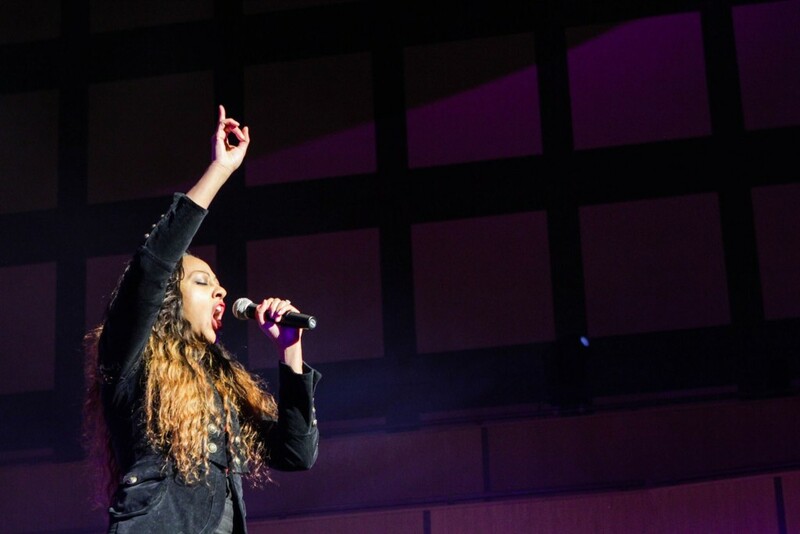 Other notable solo performances came from recording artists and worship leaders including: Niyoki, Eric Coates, Craig Eakright, and Danielle Cummins, as well as VOU student Aspen Hill. Each of them displayed a level of outstanding artistry, and a passion for praise and worship. The concert ended with a powerful original song written and led by Marcellus Barnes. The song was a beautiful reminder that all that we go through in this life, and every good thing we strive to do for one another, “it matters!” The final number was accompanied by a beautiful visual display of images of God’s people, from all walks of life, projected on a large screen. As the images continued to appear on-screen, audience members joined hands, and crossed aisle, crossing barriers of age, race, gender and perspective, as they sang along. It was moment reflective of divinely inspired, heavenly unity. Although UNITY has been in existence for nearly 15 years, well over half the audience stood up when asked if they were first-time VOUYC concert attendees. Whether audience members were first-time attendees, or faithful UNITY supporters, the concert was an immensely moving and inspiring experience for everyone in the auditorium. 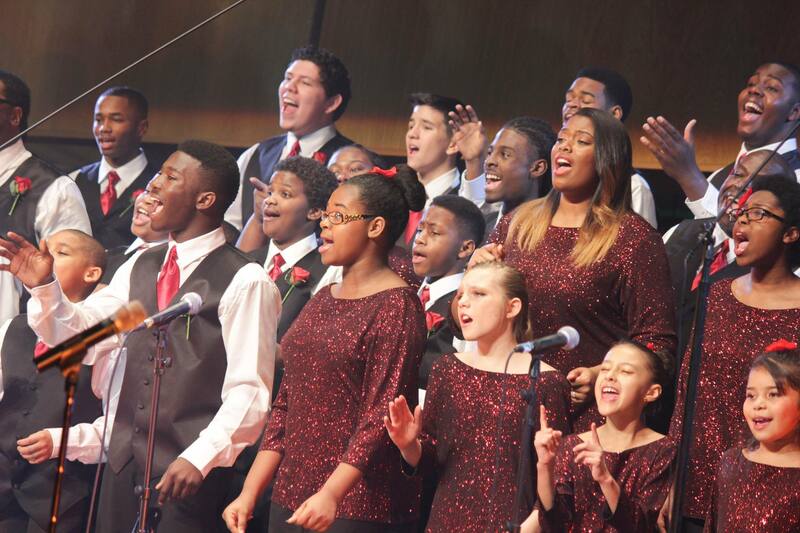 If you missed this incredible concert, or would like to see videos of other VOUYC performances, please follow us on social media sites, Facebook at Voices of Unity Youth Choir – USA Choir Olympic Team, on YouTube at VOUYC and on Instagram at @voicesofunityig. Also, please visit our website, www.upaf.com, to find more information on the official Journey to the Vatican Campaign, and to share your concert comments with us!